To celebrate National Sandwich Day, the Dr. Sears Wellness Institute couldn’t help but search out the easiest (and healthiest) sandwich option. 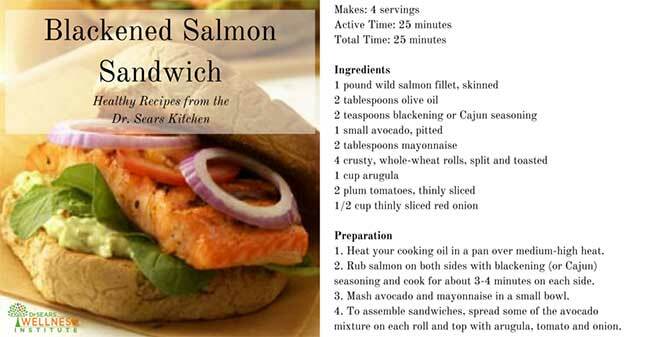 Considering all the healthy omega-3 benefits of seafood, it was natural that we’d choose a sandwich that includes salmon. This Blackened Salmon Sandwich recipe is simple, quick, tasty and good for you. Enjoy it on National Sandwich Day, or any other day you choose! 1. Heat your cooking oil in a pan over medium-high heat. 2. Rub salmon on both sides with blackening (or Cajun) seasoning and cook for about 3-4 minutes on each side. 3. Mash avocado and mayonnaise in a small bowl. 4. To assemble sandwiches, spread some of the avocado mixture on each roll and top with arugula, tomato and onion. Download + print the recipe here. Original recipe adapted from EatingWell.com.